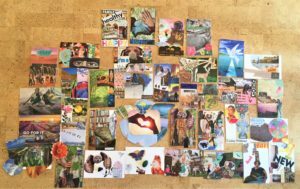 Our popular yearly ritual in December is the creation of SoulCollage cards. These cards help you bring in new energy and hidden wisdom from your deepest self– relating to what you want to let go of as the year ends and what you want to manifest in the New Year. I will lead you through a guided meditation to help prepare you to manifest whatever wants to come forth through the SoulCollage cards.